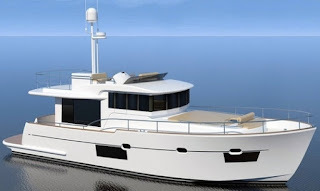 Estensi continues to renovate it's range and here we see the Italian builder update its 480 Maine model to the new 485. Reinvented outside with new hull side windows, the entry level new 485 continues its standard for a reliable sea worthy explorer cruiser. The Estensi 485 Maine features a three cabins two head interior, with lower deck galley located in between the cabins. The Estensi 485 Maine is powered by twin 370hp Volvo engines.